Many lesbian couples are in need of lesbian relationship advice, to aid them in building a happy relationship. 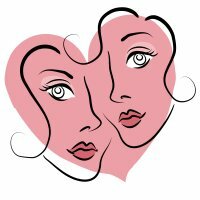 Today, there are few relationship models for lesbian couples to look to, and that's why good relationship advice may be very helpful. Lesbian relationships, just like any other relationships, have their ups and downs. There is a myth that lesbian relationships are always and equally perfect. The truth is that they're not. Your relationship is unique and unlike any other. You and your partner may have many similarities, but you are two different people, each with their specific traits. Your main problem could be homophobic peers, who may try to force you into hiding your affection. One of you may be ready to come out and show their affection in public, while the other one may fear it. One or both of you may start feeling hurt, guilty, insecure, and unloved. Remember that what's happening has nothing to do with your couple. Social harassment is hard to bear even for the most courageous people. You may need to protect your love from society, but you don't need to protect it from each other. Instead of taking out your feelings on each other, learn to communicate and try to understand each other, especially when it comes to fears and concerns. Communication is the key to any good relationship, and the best thing that your couple could do is create an open and clear communication channel. The bottom line for any relationship: address your resentments, take time to listen to each other, try to truly understand each other, and you will succeed in building a happy and lasting relationship. Return from Lesbian Relationship Advice back to the Relationship Tips page.